Join us in revisiting Chanda Kocchar's prolific journey. Yesterday, in news that was not that shocking, the sun set on one of India’s most celebrated banker Chanda Kochhar’s career. In a BSE filing, ICICI Bank’s board said that Kochhar had sought early retirement, and the request was immediately accepted. She is often credited for having steered ICICI Bank unscathed from the aftermath of the 2008 Lehmann crisis that caused a global meltdown. Moreover, it requires immense courage and tenacity to make your mark in a male-dominated industry; Kochhar achieved just that. But, instead of a glorious exit, she has opted for a rather meek and controversial end to a career spanning over three decades. Meantime, though her fall from grace is debatable, her rise to fame has been nothing short of extraordinary. Let’s revisit her journey here! Kochhar, who originally hails from Rajasthan, lost her father at a young age. Subsequently, her family moved to Mumbai, where she pursued her Master’s in Management Studies from Jamnalal Bajaj Institute of Management Studies. An exemplary student, Kochhar shone bright in academics as she received the JN Bose Gold Medal in cost accountancy and the Wockhardt Gold Medal for excellence in management studies. 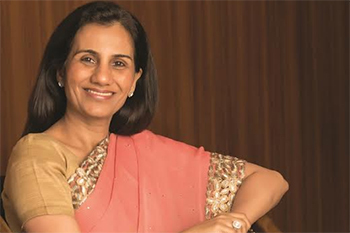 Following her graduation, Kochhar joined the erstwhile Industrial Credit and Investment Corporation of India (ICICI), which was then an NBFC, as a management trainee in 1984. There was no looking back from here. Apart from handling basic core functions, Kochhar was also asked to look after industries such as petrochemicals, textiles, paper, and cement. In 1994, when the firm made headway into commercial banking, she was elevated to the post of assistant general manager and later deputy general manager. She helped establish the bank’s lending in the telecom, power, and transportation sectors. She swiftly climbed the corporate ladder and made history in 2009, when she was appointed managing director and chief executive officer. Kochhar, considered a favorite of her distinguished predecessor MV Kamath, was chosen from a talented pool of candidates such as Shikha Sharma, Renuka Ramnath, V Vaidyanathan, and Kalpana Morparia. How did she contribute to the organization? MV Kamath enjoys the distinction of bringing the EMI (equated monthly instalment) culture in the country. This spurred the growth of retail loans (home, car, credit card, and personal loan) among the country’s youth. However, the bank found itself in a tight spot after retail loans soon became non-performing assets on the back of the global financial crisis of 2008. Thus, despite having extended the ICICI franchise in all its spheres: banking, mutual funds, and insurance, she had the guts to “shrink” the organization to address the bad loans issue, conserving capital and focusing on credit quality. She also cut down on her mentor Kamath’s preferred sector retail loans, especially the unsecured ones. Within a year of taking charge, she reduced the bank’s exposure to unsecured lending from 8% to 5% (March 31, 2010) of the total loan book. Instead, she focused on infrastructure loans, which were considered her forte. What’s more, there was a huge demand for these at the point in time. However, corporate lending too hit rough weather on the back of a slowdown in economic growth and substandard underwriting in banks, leading to a surge in bad loans. Even as the bank was sparring with its circumstances, Kochhar faced a crisis. In 2016, a whistle-blower Arvind Gupta in a blog post accused her of conflict of interest while authorizing loans to the Videocon group. Initially, these allegations didn’t receive much traction. However, they returned with a vengeance in 2018. Apparently, Videocon Group chairman Venugopal Dhoot’s subsidiary company invested Rs64cr in NuPower Renewables, promoted by Kochhar’s husband Deepak, in 2010. Later, it was alleged that the company’s proprietorship was transferred to a trust owned by Deepak for Rs9lakh after Videocon received a Rs3,250cr loan from ICICI bank in 2012. Though the bank initially denied the allegations, increased pressure from the media and government forced the board to appoint a panel headed by retired SC judge BN Srikrishna to probe the allegations. So, what next for Kochhar and ICICI Bank? Though the Srikrishna panel’s findings are yet to be unveiled, Kochhar will first have to grapple with investigations. Moreover, she is free to pursue other interests as the resignation relieves her from the code of conduct of the bank. For now, ICICI Bank will be helmed by Sandeep Bakhshi, an ICICI veteran. It remains to be seen how Bakhshi manoeuvres the bank out of these stormy waters.